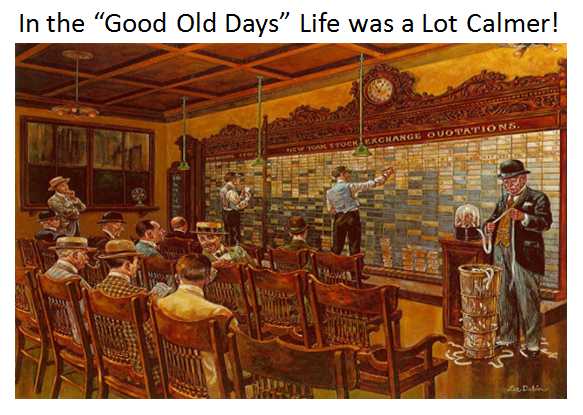 Ian Woodward's Investing Blog » In the “Good Old Days” Life was a Lot Calmer! In the “Good Old Days” Life was a Lot Calmer! My good friends are in the swing of things and send me pictures I might use for the blog, which keeps me on my toes. Please keep them coming. Here’s one that fits very well with the times. Can you imagine giving up all that gain we had yesterday with another down day of over 350 points on the DOW today? 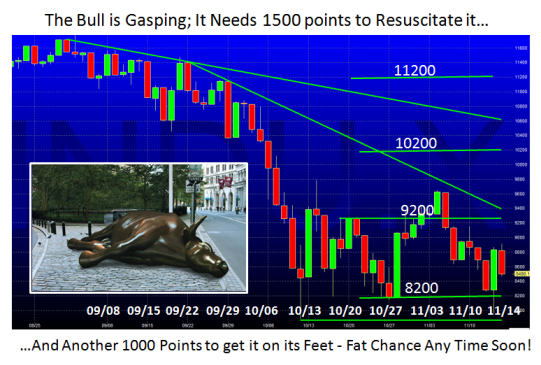 The chart shows we have been in a trading range of 1000 points or so for the past five weeks. The Market is trying to put in a bottom, but every half hour or so there are alternately both Bull and Bear traps and of course it gets a trifle tedious. I haven’t drawn the downside target, but the symmetry suggests 1000 points down from 8200 which would take us down to 7200 in a jiffy…maybe two days of heavy selling. The upside moves are more constrained and it will take a Santa Claus Rally to get some steam going to get past 9200. As I showed the other day we are in such oversold territory that all Technical Signals call for a Bounce Play, but essentially the extent of the bounce is little more than short covering, only to start the same process all over again. The mood is obvious in that there is so much Uncertainty that there is no Conviction by the Bulls other than to snap up a few bottom fishes when they feel the stops for the shorts a few points below the previous low will give a snap back until the so called rally if any runs out of steam within a day. Meanwhile the nimble can switch back and forth between the likes of the QID/QLD and are happy campers as they are nimble and stay glued to their screens. 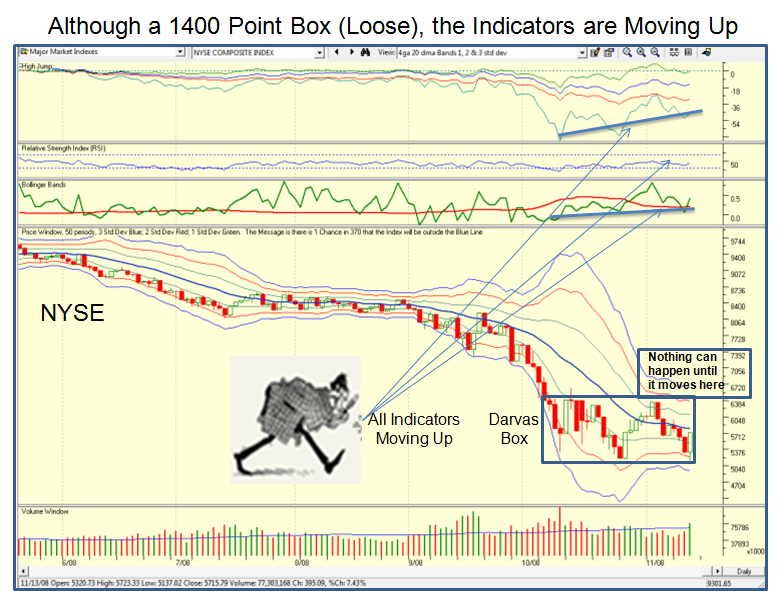 This entry was posted on Friday, November 14th, 2008 at 4:52 pm	and is filed under HGS Principles, Market Analysis. You can follow any responses to this entry through the RSS 2.0 feed. Both comments and pings are currently closed.